City Hall can be overruled, and in a hurry — but the last-minute signature drives required to qualify voter referendums are real longshots. So long that it’s been “decades” since a referendum succeeded in directly overturning city legislators’ actions. 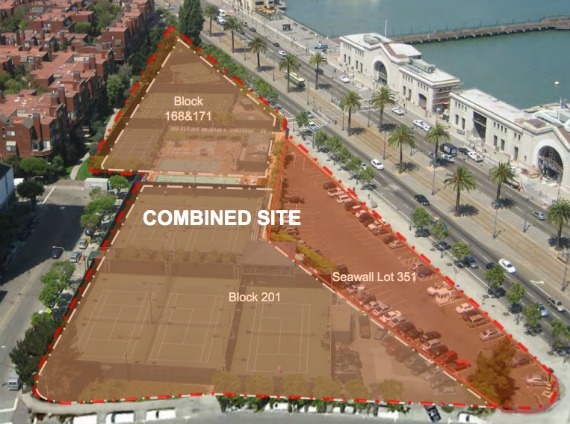 Anti-developer sentiment claimed a piece of San Francisco political history Thursday, when the campaign to halt a luxury condominium complex along The Embarcadero dropped off 31,373 signatures, well more than the 19,405 needed — and all collected in less than 30 days. The squabble over the 134-unit, 136-foot-tall 8 Washington project has gone on for years, but progressive development foes have at least temporarily halted Simon Snellgrove’s Pacific Waterfront Partners’ project while the Board of Supervisors reconsiders exempting the development from height restrictions. Board of Supervisors last month. Political forces behind the effort former Board of Supervisors presidents Matt Gonzalez and Aaron Peskin (also a former Hill Dwellers chief), the San Francisco Bay Guardian, and the SF Tenants Union. But names don’t go out and collect tens of thousands of signatures — the money to pay the 150 paid signature gatherers does. And this money came from a no-name, at least politically: northeastern neighborhoods local Richard Stewart, a retired business executive and economist, and his wife Barbara donated “$40,000 each” to fund the effort, according to campaign head Jon Golinger. Final campaign finance forms have not yet been filed, but reports from June show Richard Stewart made three donations in June: $1,000 on June 19, $25,000 on June 20, and $10,000 on June 25. Another $25,000 came from Barbara Stewart on June 20. The Stewarts donated over half of the total $150,000 raised in a short time, a feat of which any downtown developer would be proud. The Department of Elections will have 30 days to verify that at least 19,405 of the signatures are from registered San Francisco voters. If the signatures prove valid, work on 8 Washington is halted until the next Board of Supervisors meeting, where the exception to the height limit will be revisited. Stewart is a Harvard Law grad, former New York State Superintendent of Insurance, and private insurance executive, who headed up insurance giant Chubb Group in the 1970s, according to his online biography. He’s been a freelance economist since 1981. Stewart does not appear to be a regular local political player. His name does not appear in local news searches. He did not donate any money to Mayor Ed Lee, a campaign finance records search showed. Stewart could not be immediately interviewed Friday. No information on Barbara Stewart was immediately available Thursday. A Barbara D. Stewart mentioned as the former president of Stewart Economics was listed on the firm’s Web site as deceased as of 2010. No Wall campaigners blamed Snellgrove for some campaign shenaningans: Volunteers for the effort at times were “harassed” by operatives “paid for by the developer,” Golinger and others said at Thursday’s rally. There has been speculation that whoever bankrolled the anti-8 Washington campaign had a competing interest with Snellgrove. It’s not clear if either of these donors have or had interests in real estate development.